I have always liked black and white images. There is something classical and timeless about a monochrome image that hearkens back to the formative days of photography. Without the distraction of color, it is up to the composition, contrast and texture of an image to tell the story. Converting a color image to monochrome should be a ‘special treatment’ not a way of ‘fixing’ a color image or making it ‘useable’. Many images simply will not work well in monochrome but those that do will reward the post-processing time. 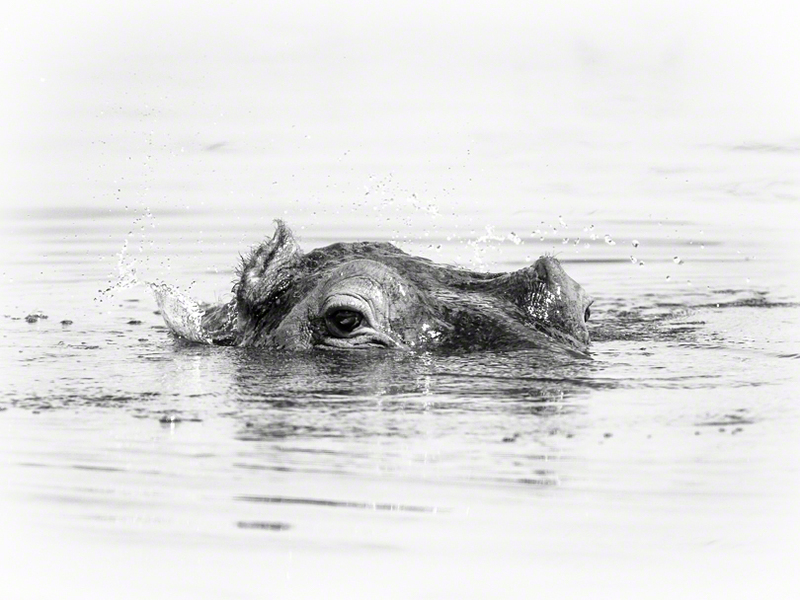 Wildlife photography is a genre that is usually expressed in color. The reason for this is obvious. The natural colors of animals, particularly brightly colored species, can be striking and often an attractive environment or warm lighting will also be important to the image. Most of my own wildlife images are in color for this reason. However, monochrome conversions can also make images that are appealing and compelling in a completely different way. We are fortunate in the technological age we are living in to have great digital cameras that allow us to capture images in RAW format then decide later how we want to edit the image. This flexibility also means that (unlike when using black and white film) we have all the color information that can be manipulated during the conversion process to get the effect we want. This could only be done in-camera for black and white film by using colored filters. Monochrome images reward a strong and bold composition. Composition is important for all images, but without color to inform the viewer, the composition or form presented can become all there is to make the image. Make sure your animal subject is clearly defined or delineated in the frame. In the following example, the graphical nature of the horns and the crisp back-lighting enhance what is already a very striking form. The color version of this image is great in its own right but the monochrome version emphasizes the shape of the horns even more. 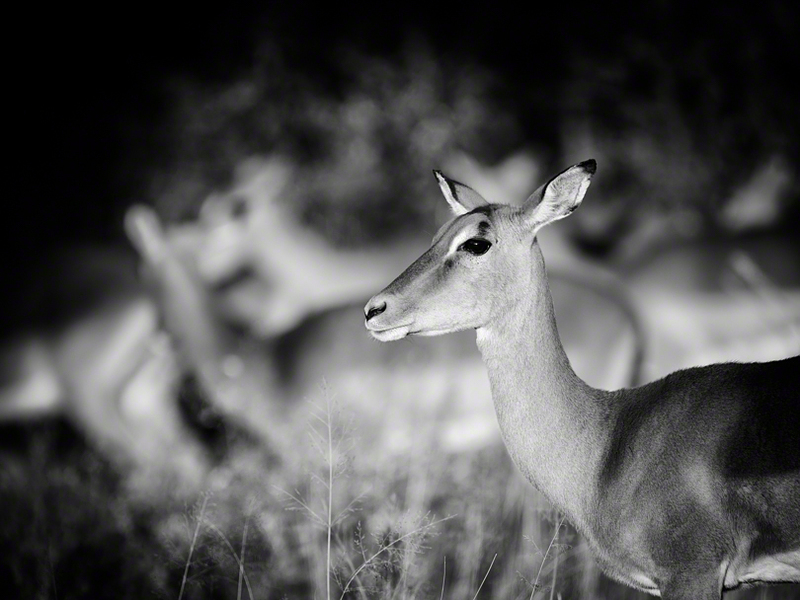 When in comes to black and white photography, contrast is usually the most important factor. An image that has a low contrast color palette may not make an impact-full, high contrast monochrome image because the colors will tend to convert to a mid-range of low contrast grays. Look for images that show solid areas of shadow and nice bright highlights for a punchy monochrome conversion. This does not necessarily mean that shooting in the middle of the day when the light is high contrast will get you the best results (although it can get you results when color can’t at times). The practice of shooting in the early morning and late evening apply just as well because you can still see the softer quality and lower angle of the light even in monochrome images. Having good crisp contrast also enhances the appearance of ‘sharpness’ in an image, something wildlife photographers look for, especially around the eyes. 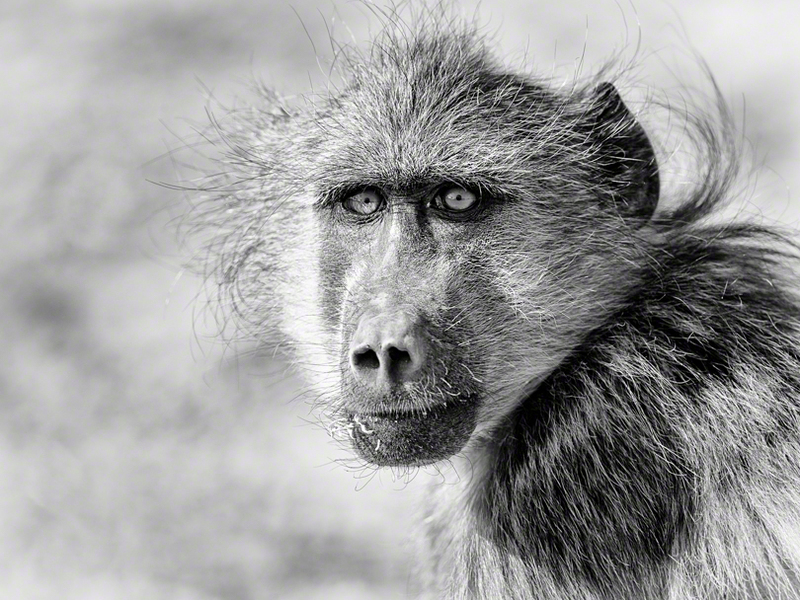 With some selective editing, the baboon portrait image below has eyes that really come to life with contrast. A yellow filter has lightened the cornea’s and the socket shadows make them stand out further from the generally lighter surrounds. 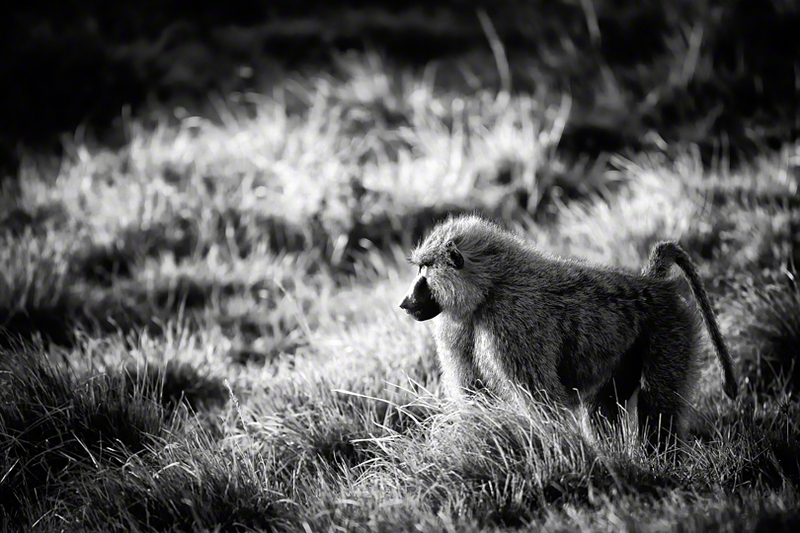 The hi-key monochrome image has a mostly light balance of tones, especially in the background. They well suit a minimalist style of image that has a subject framed by light tones such as the following two examples. The hi-key background is an excellent way to introduce a high level of contrast to the subject of the image or provide context. I will often enhance the effect with a white vignette and burning in the lighter areas. 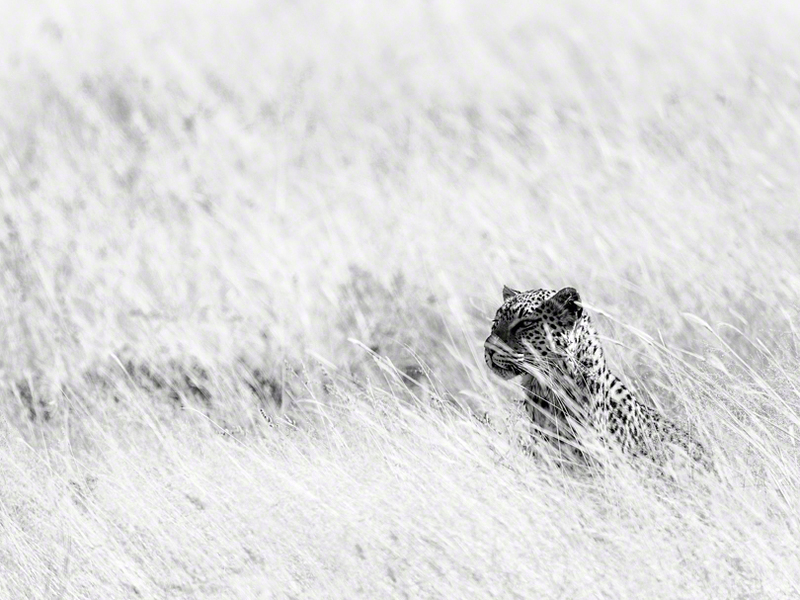 The leopard image below, taken in Etosha National Park, also has a nice textural feel to the lighter areas of grass. Lots of shadows and dark tones make for a moody or dramatic low key image. The tones should be mostly dark with lots of black but they should be offset by some highlights that draw the viewers eye. 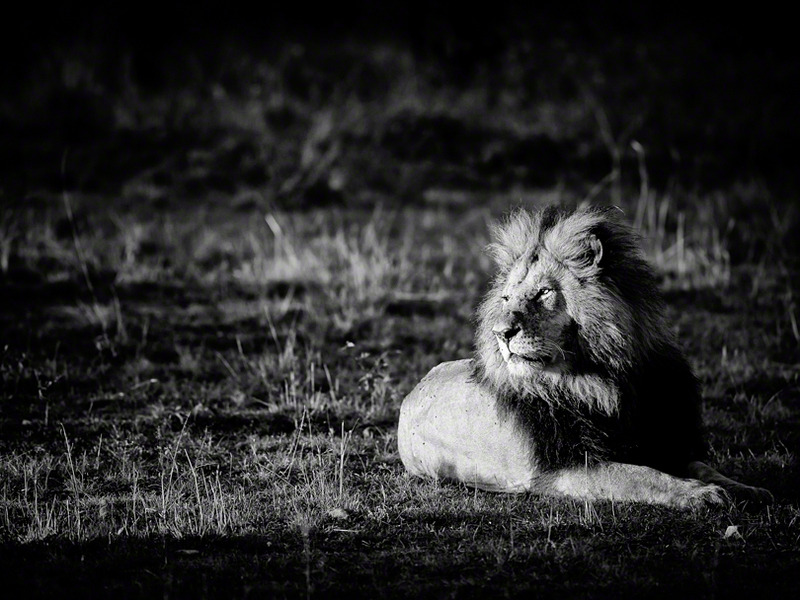 The lion image below, taken in Kenya, was a good candidate for this type of processing. The image was taken at sunrise with a very low sun angle that was casting long shadows around him, yet lighting him nicely. 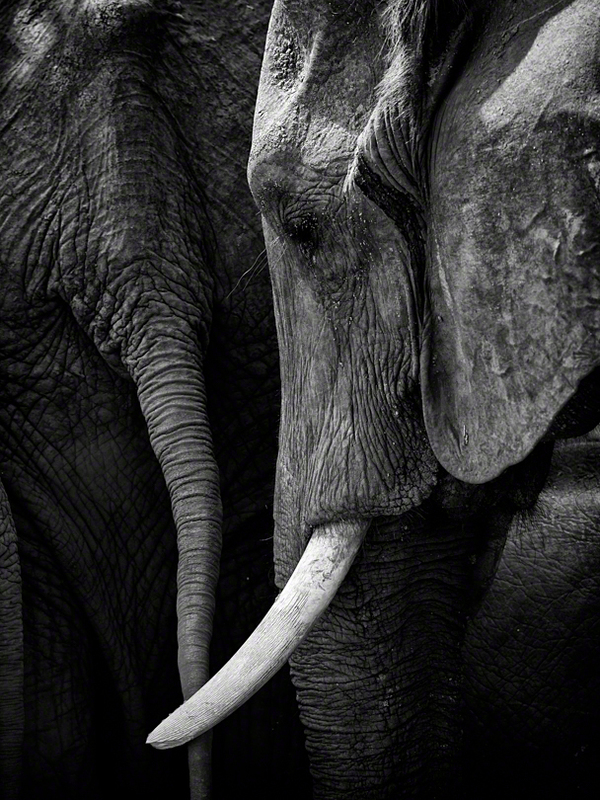 Like gritty street photography, black and white conversion suits gritty wildlife subjects. 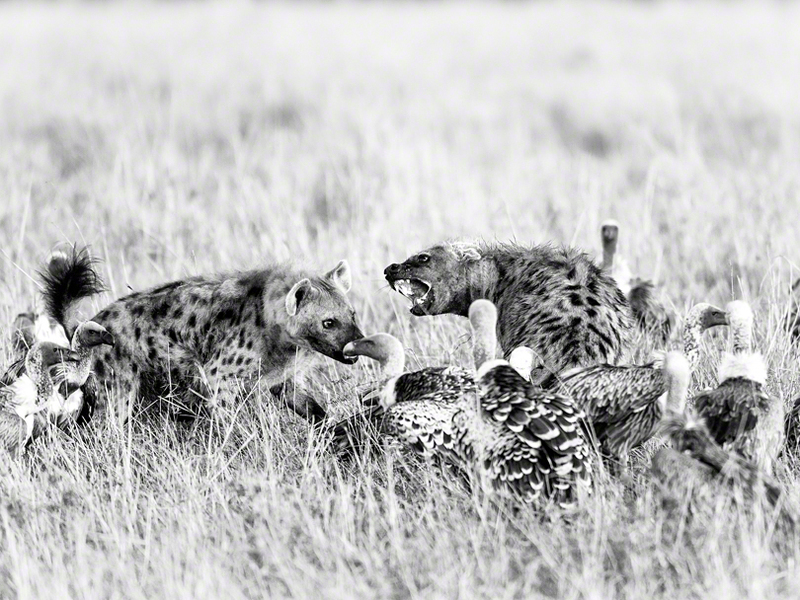 The often brutal game of life and death in the natural world does result in some hard-edged subjects or scene’s and I think the honesty of the monochrome image can really be used effectively to showcase these harsh realities. 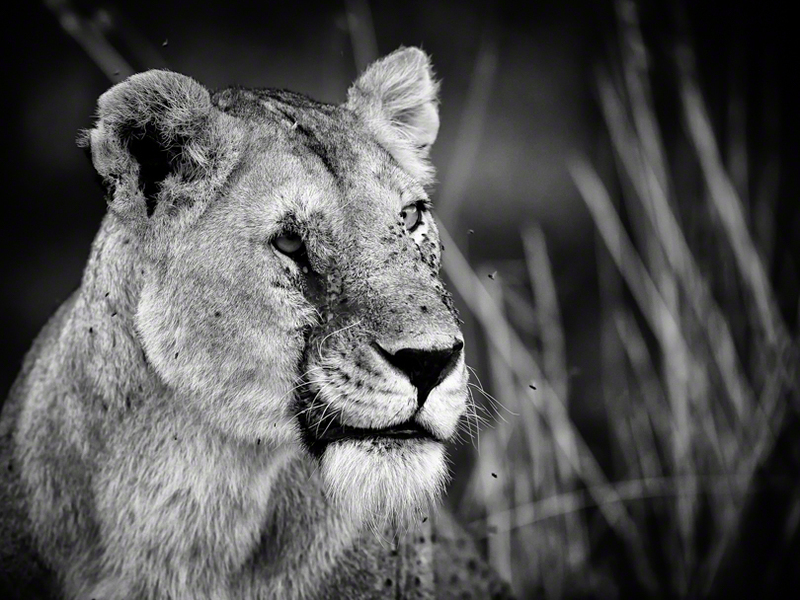 The dark background and intense stare gives this wounded but thriving lioness a determined demeanor, perfectly portrayed by the clarity of monochrome tones. 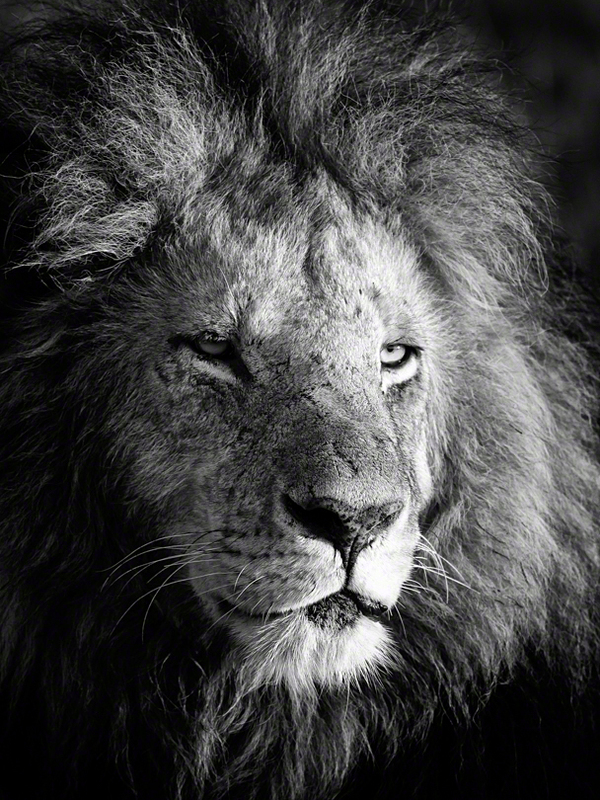 A dignified and imperious lion is the perfect subject for a classic black and white portrait but many other animals will provide great subjects too. Lighting will be important for these types of images. You can achieve a ‘studio’ lighting effect with some low, soft, morning or evening light that lights the face in a way that gives it depth. If the light is striking the face from the side and slightly above, you will get that well-defined studio lighting look. Quite often getting these types of shots will require very long telephoto lenses to get close enough for the head only portrait. I have often had to use a 500mm lens plus extender on a ‘crop’ sensor body to achieve frame-filling portraits. 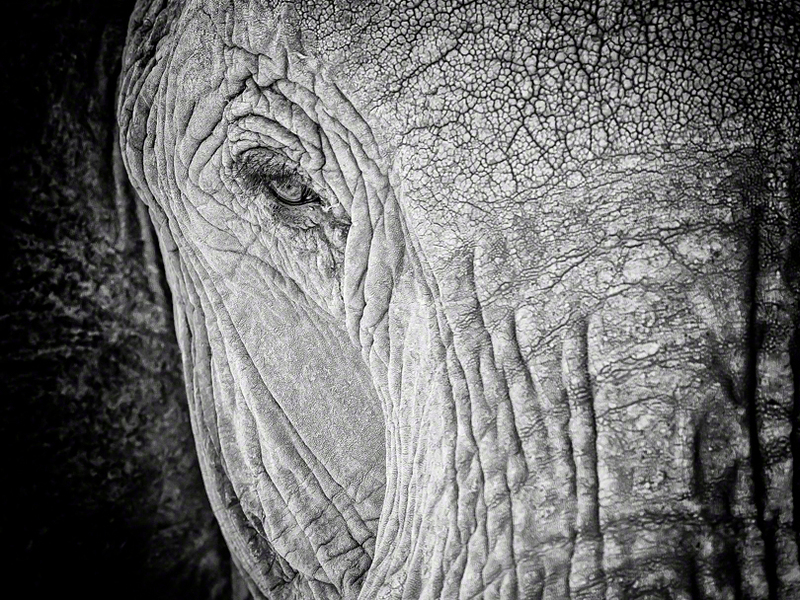 Some animal subjects have great textural surfaces that can be made the hero of an image with careful editing. Scales, wrinkly hide, ruffled feathers, whatever image catches your eye in terms of texture could make a good candidate. Boosting the structure or clarity sliders in your chosen photo software can help bring out the fine details. 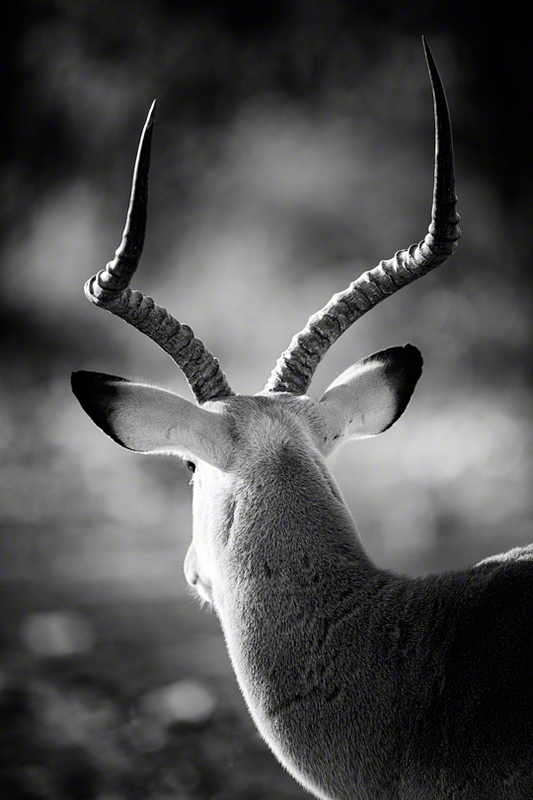 Backgrounds also have nice textures that can enhance your image as the below image of a Lechwe antelope shows. The grass and grass seeds complement the fur texture with the contrast around the face and horns providing a final resting place for the viewer’s eyes. I used the structure sliders in Silver Efex Pro to boost the micro-contrast in the vegetation. 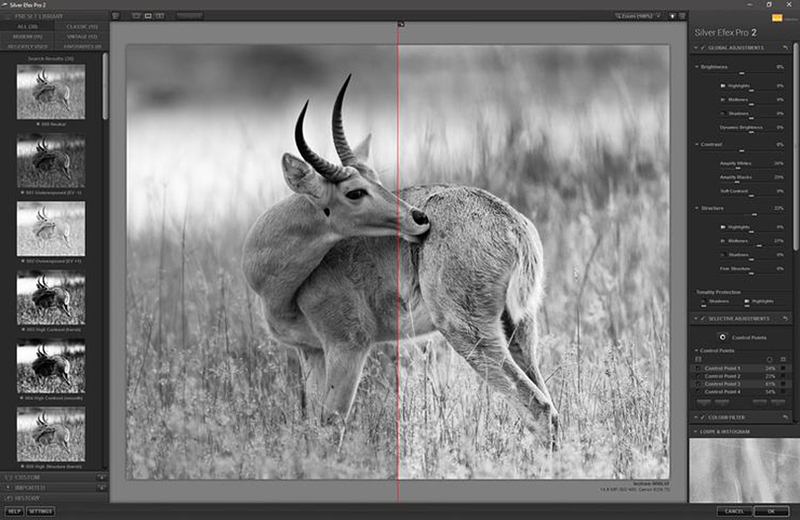 My main tip for converting your image to monochrome is to use Silver Efex Pro. It is now a completely free plug-in for Lightroom and Photoshop and is one of the most powerful and easy to use pieces of software for post processing that you can have in your toolkit. The level of global control over the images is very fine grained plus the use of control points make it a very quick to carry out local adjustments. There is also vignetting, color filters, edge burning and toning adjustments available. When you first run the add-in you will see a thumbnail strip on the left-hand side which automatically generates previews for built-in presets. You can select then modify a preset or start from scratch to get the effect you want. An important process is required to get the most out of using the Google Efex add-ins. I export all my RAW files using Lightroom as 16 bit TIFF files. Once opened in Photoshop selected “Filter” from the menu bar then “Convert For Smart Filters”. Doing this means that when you run the add-in from you filter menu a new adjustment layer will be created in the file for that plug-in. Further plugin applications such as Dfine will create further layers. This non-destructive editing doesn’t touch the original file and importantly, allows you to reopen the plugin adjustments to make further changes at a later date. It is important to remember that monochrome conversions use the color information from your file to return a result. 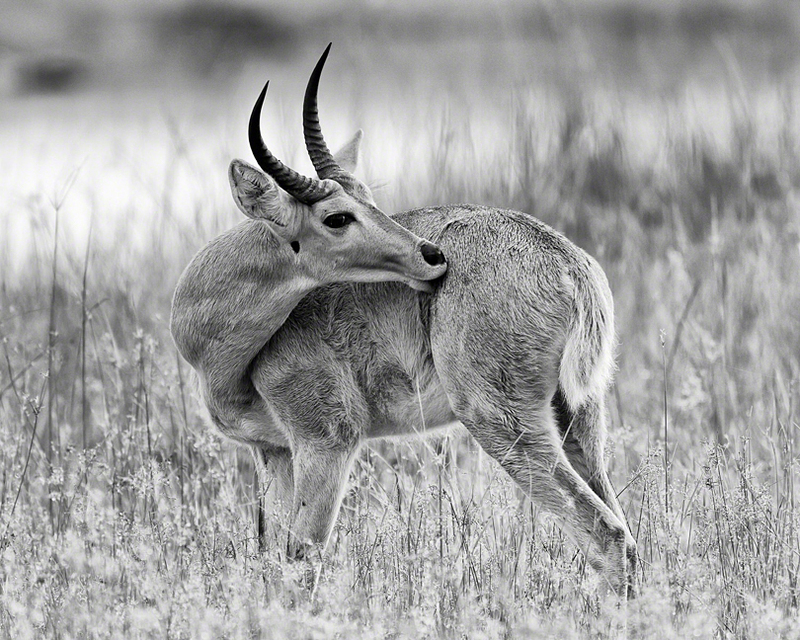 In the above image of a Lechwe in Botswana scratching itself, I used a boosted green filter to lighten the bright green grass around the antelope. This separates the animal somewhat and lightens green areas of the image nicely. 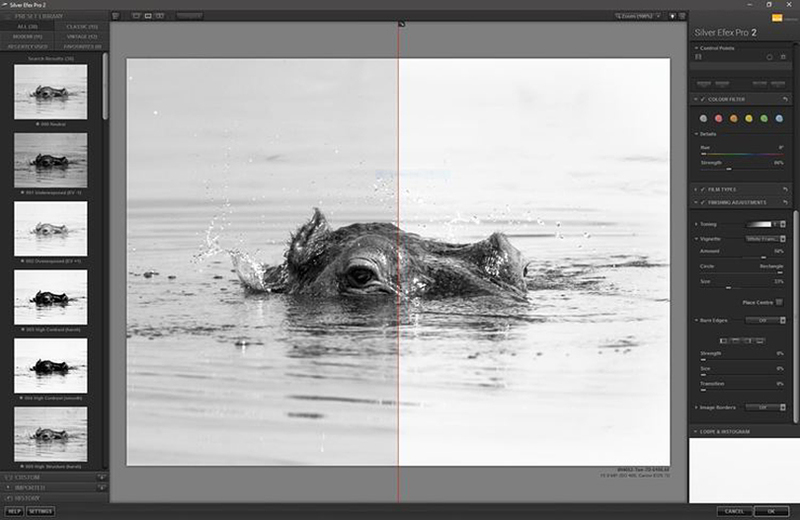 So in conclusion, I guess my main point is not to forget the black and white option when processing the images from your wildlife photography trip. Experiment with some monochrome conversions. You might be surprised by the results!